August 25, 2015 August 25, 2015 Nefer Khepri, Ph. D.
Many of you may be wondering just what is all the hoopla over intuition anyway? Why do so many believe it’s important to be intuitive? Your intuition is important because – to put it into modern terms – it is your internal spiritual GPS. Your intuition is a guidance system of the finest caliber. Each of us is a creation of the Divine; and, as such we each contain a Divine Spark. That spark is your intuition. Your intuition was placed within you so you would always have a way to directly connect with Divinity no matter where you go, what you’re doing, or how you’re feeling at the time. 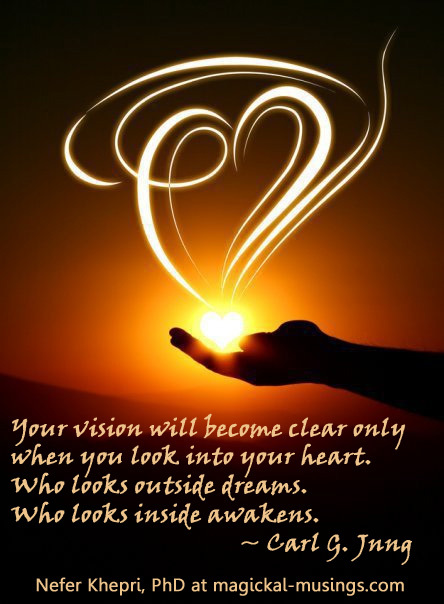 Your intuition is there and it is always in the “on” position. Your intuition is the one app that never shuts down and never ever crashes. But what if I can’t HEAR my intuition? What if I already know nothing is there? I’m not intuitive in the slightest. I don’t have an internal spiritual GPS-thingy, but can I order one for my smart phone? Last I checked no one has invented an app for intuition, but one is probably in the works. Until then, I am here to tell you that EVERYONE IS INTUITIVE whether you have ever sensed you are or not. You ARE. The trick is in learning HOW to listen to your intuition. There is a little method I learned when I was a teenager that I have adapted for my own use. I have used it with great success and you can as well. This is a simple method, and as many of you already know, simple is always best because simple works. In order to over time develop the ability to tune into your own intuitive guidance system follow this practice for 3 minutes every day for a week. For the second week increase the time to 5 minutes per session. By week 3 you should be up to 7 minutes. The goal is to reach 10 minutes. Try to choose approximately the same time every day. I followed the practice at night before going to sleep. This can also lead to some very interesting dreams, just FYI so it may benefit you to keep a notebook by your bed so you can take notes. Make sure you will not be interrupted and sit in a comfortable position. Close your eyes and take 5 – 10 slow deep breaths. Be sure your lungs expand and contract as much as you can manage. You will keep your eyes closed for the duration of this exercise. After the breathing exercise imagine a beam of gold sparkly light flowing down and entering you through the very top of your head. The top of your head is the location of your crown chakra. Imagine this gold sparkly light as feeling warm. Feel the warmth flow slowly down to the center of your forehead, just above your eyebrows. This is the location of your third eye chakra, the seat of your intuition. Imagine this golden light sending its warmth slowly through your entire head as it moves down to your throat chakra. Feel the warmth of the golden light swirl there for a moment or two, then envision it heading down to your heart at the center of your chest. When it reaches your heart at the center of your chest the golden light is located now in your heart chakra. Try to listen for the sound of your heartbeat. Don’t stress if you can’t hear it yet. It will become noticeable the more you practice this little exercise. Feel the light circle around your heart chakra, then slowly start to move back up to your throat chakra. Allow it to swirl 3 – 5 times within your throat chakra and envision the light moving back up to your third eye chakra. Have it swirl around there a few times and then see the golden light moving back up to your crown chakra. Envision the light as REMAINING within your crown chakra at the top of your head. Open your eyes. This ends the exercise. The crown, third eye and heart chakras are all the upper chakras and are more focused upon your spirituality, intuition, and emotional well-being than our the lower chakras (solar plexus, navel and root, respectively). The upper chakras are what I use most in all of my spiritual work, though some will say the solar plexus chakra (located at the base of your breast bone) is also important, personally I don’t feel that, but if you feel it may be important for you, by all means you can continue the exercise and also focus the golden light as being within your solar plexus chakra. You could even do this for all seven of your main chakras. It certainly won’t hurt and will help to bring balancing and healing energy to you from your crown on down to your root chakra. Just be sure to envision the golden light moving slowly back up through each chakra & then remaining in the crown chakra. That’s very important. The first few times you do this exercise it should take about 3 minutes to complete. You can move slower if you want, but please do not do it any faster than 3 minutes. Should your mind begin to wander simply bring it back to focusing on the golden light and your upper chakras. Do not stop the exercise. Over time your mind will learn to focus better and soon will wander less and less while you do the exercise. The golden light is your connection to Divinity (any manifestation of your choice). It is always present, but you strengthen it every time you practice this simple exercise. When you end the exercise and imagine the golden light remaining within your crown chakra what you are doing is using the golden light to feed your crown chakra, thus reinforcing your own personal connection to Divinity. This, in turn, feeds your intuition and helps to strength it so at some point you will begin to hear or sense your intuitive guidance. I will warn you that for some of you this will work very quickly and for others it may take weeks, maybe even a couple of months. Do not despair & do not give up! Just be patient with yourself. For many of you such visualization may be a brand new experience so it’s going to take your brain a bit of getting used to doing the exercise until at some point the exercise will become second nature and you will be able to practice it at any time. A voice. It’s that still, inner voice you hear so much about. It kind of sounds like your own voice, but not exactly. Some of you will hear actual words. A feeling. You may be heading to the store, but suddenly get a “bad” feeling, change your mind and not go only to discover a freak storm broke out and you would have been caught in it. A physical sensation. Your intuition sends messages to your body that then reacts in certain ways. Me, I always feel it in my stomach or in cases of danger, the back of my neck. An extreme example of intuition working in this manner comes from my dad’s life. In 1979 my dad was on his way to Mexico City from Los Angeles. He had been visiting family in California before continuing on to Mexico to visit other family members. He was booked on Western Airlines flight # 2605 on Halloween, 1979. While at the airport waiting to board the plane with one of his sisters who was also going with him, Dad got a REALLY BAD feeling. He felt nauseated & told his sister he had to use the restroom. He didn’t end up vomiting, but still felt horrible. As he went back to the gate he told his sister he didn’t think they should get on the plane. My aunt was psychic herself and all day long had been experiencing what she thought at the time was a very long and intense hot flash. She had just begun to go into menopause, she figured. She told Dad it would be fine, he was just nervous, but Dad insisted something awful was going to happen & he told her they should not get on that plane. They argued until people began to board, then my aunt thought better of it and they changed their reservation to a later flight. Western Airlines flight # 2605 crashed upon landing in Mexico City, hit a truck, then a building, caught on fire and 72 of the 88 passengers died. Up until that time it was the third worst airline disaster (now it is currently ranked 7th). My dad’s intuition had given him nausea, or maybe his angels or spirit guides caused him to feel that bad. We’ll never know, but the end result is that both my father and aunt lived to talk about it while 72 other unfortunate people did not. When they heard about the flight upon landing later that day in Mexico City my aunt passed out from the news. The plane had caught on fire and that, to her, explained her day long hot flash, which stopped roughly at the time flight 2605 crashed. My dad and aunt’s experience is an extreme example of how intuition can warn a person and it exemplifies how our intuition can send our physical body messages in order to get its point across. We just have to be astute enough to correctly interpret those messages. I wish you great success on using my simple little exercise in order to increase and strengthen your intuition. Over the coming weeks please comment and let me know how it’s working for you. Text copyright Nefer Khepri, 2015.